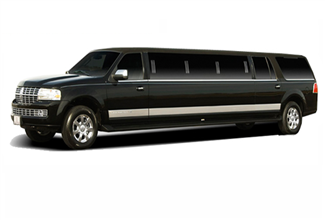 A larger option in the stretch limo type is the Lincoln Navigator Stretched SUV. Seating up to 12 passengers (10 people comfortably), the Navigator stretch is the only vehicle in the extensive fleet of Global Alliance that offers a choice in colour: black or white. This vehicle is a popular choice for weddings, particularly the white model as might be expected. It’s hardly weddings-only vehicle, however, and clients (especially younger ones) have found it a comfortable and fun option for evenings out as well as for other social functions. 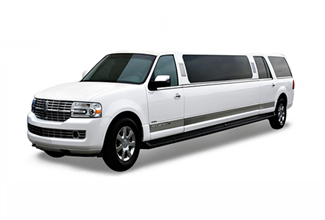 It is vital to note, however, that as enjoyable as it the Lincoln Navigator Stretched SUV can be as a social vehicle, it’s not nearly as well adapted for airport transfers. Its length makes it difficult to maneuver in and out of the pre-arranged compound and unlike the trunks of the Town Car stretches, the Navigator stretch has no rear luggage space at all while sharing the safety prohibition against storage luggage in the seating area. 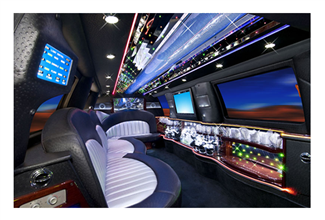 All of our stretches have fiber optic lighting in the interior, CD and DVD players with a stereo audio system, and tinted windows for added privacy. Features: TV, DVD, MP3, bar, interior fiber optic lighting.